Why is a group of Dublin residents so concerned about a cycle lane? COMMENT & ANALYSIS: LONG READ: In our last two articles (here and here) on the planned Fitzwilliam Cycle Route there was mentions of concerns from the South Georgian Core Residents Association, but it was not very clear why the group were objecting. In this article, we look at and respond to concerns they have outlined to Dublin City Council. First, who are the South Georgian Core Residents Association? They seem to be relatively new group set up this year. There’s only three mentions of them in a Google search — a news story on this website, a city council document relating to a local area meeting this month, and their Facebook page with three likes and four followers. Besides their concerns about this route the only online record of the group asking about anything is them looking for traffic calming on Lad Lane — which is something the cycle route project at least partly addresses. ttp://irishcycle.com/wp-content/uploads/2018/07/Cycle-route.png”> IMAGE: Most of the space on the streets will still mainly be for one thing: cars. Concern 1: Do we need it and what data is being used to support the need for this cycle route? We would like to understand the data being used to justify the project. According to the AECOM report, there has been one minor incident involving a cyclist and a car in the last three years and it was minor. So what data is being used to support the prioritisation of this route at this time given that it was not identified as a primary route in the GDA cycle route, it is largely safe for cyclists and there is another cycleway 50 yards away. Some questions which were asked? What exactly is the problem they are trying to solve with this cycleway? The proposed cycleway runs parallel with the canal cycleway, what is the justification for having two cycleways so close together when there is a very significant and identified need for radical cycleways into the city centre as identified in the GDA cycle network plan? Lesson Street Bridge is a particular problem along the Canal Cycleway, why is DCC not prioritising a solution to this identified problem along that cycle route? Why has this portion of a secondary link route being prioritised over the development of the major radial routes? Are cyclist experiencing particular problems along the Fitzwilliam Cycle Route? What was the planned capacity of the canal cycle route and what is its current untilisation? What methodology do DCC use to priortise routes? What data was used to direct DCC towards the Fitzwilliam Cycleways at the expense of the primary cycle routes in the GDA Cycle network plan? ANSWER 1: Heath experts, climate change experts, the Citizens’ Assembly, Government and city policy all call extra space and priority to be relocated for cycling. But, every time a council plans for such, somebody objects or raises a ton of concerns. First, this route is not proceeding at the “expense” of other routes. It is not the highest priority for the city — the Liffey Cycle Route and Clontarf to City Centre Cycle Route are prime examples of higher priority routes. Cycle routes on most arterial roads in this areas and across the city are now under the remit of the infrastructure element of BusConnects, a Government-supported project which is proceeding and expected to reach public consultation within a month or two. Like the arterial routes and BusConnects, the Liffey Cycle Route process is currently under review by the NTA. The Clontarf Route is at detailed design stage and proceeding to construction next year — it is a longer and more complex project involving a large amount of kerb changes, paths at the edge of a park, a large volume of buses and general traffic, drainage changes etc. It has not only building-to-building changes but changes inside a park and under the surface changes. The Fitzwilliam Route on the other hand has no kerb changes except build outs and is all surface level. It mostly only has kerb-to-kerb changes. It is a relatively simple design on a wide street which can be implemented far quicker than cycle routes on main roads, especially routes which have pinch points. As the Leeson Street junction with the Fitzwilliam Route will be included with this project, it would be worth extending this to look at the fixing the canal route at Leeson Street Bridge. Having “two cycleways so close together” is an advantage, not an issue. To enable cycling for all ages and abilities it will be common enough to have cycle paths close to each other. Concern 2: Does the proposed development serve all road users? Context: The road is used by a multiplicity a user types and we wonder if DCC has considered each User separately and examined how they use the road and how their User Case will be served by the cycle route. Context: Eight times as many motorists as cyclists use this road, many travelling long distances to get to work, the new model involves the reduction in traffic lanes. What simulations have been done to map traffic flow as a result of the reduced traffic lanes? What delays can motorists expect to experience at peak hours as a result of the proposed development. Will there be “residents only” parking zones for residents along each element of the route? The new bus plan has a bus coming up Cumberland Road, turning left onto Lesson Place every seven minutes. And the Bus Connects bus route from Merrion Sq South along Fitz St to Baggot st.
How is this being integrated into the planning? Have their challenges been mapped and catered for? And this project will not just improve conditions for cycling — switching to parallel parking will make the road safer for all, reducing the space between cars where motorists drive will slow speeds and again make things safer for all. Narrowing junction radius and width and adding raised crossing will improve safety and priority to pedestrians as much as or more so than people cycling. These are all classic pedestrian safety improvements. With cycling and improved infrastructure, bicycles will quickly outnumber cars at peak times. Infrastructure will also help enable cycling for all ages and abilities. Already — before intervention — Merrion Square East has 202 cyclists vs 272 private cars in the northbound in am peak and 177 cyclists vs 224 private cars in northbound in pm peak. 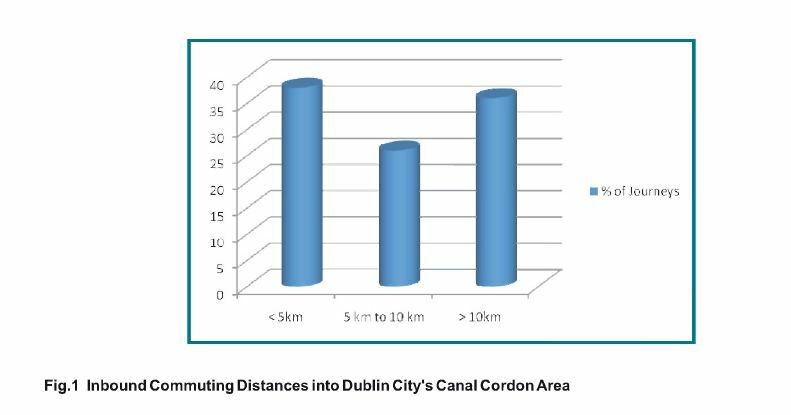 Within the canals, less than 35% of commuters traveling into Dublin city centre travel more than 10km — the best way to make space for those people who need to drive is for others, who can, to stop driving. 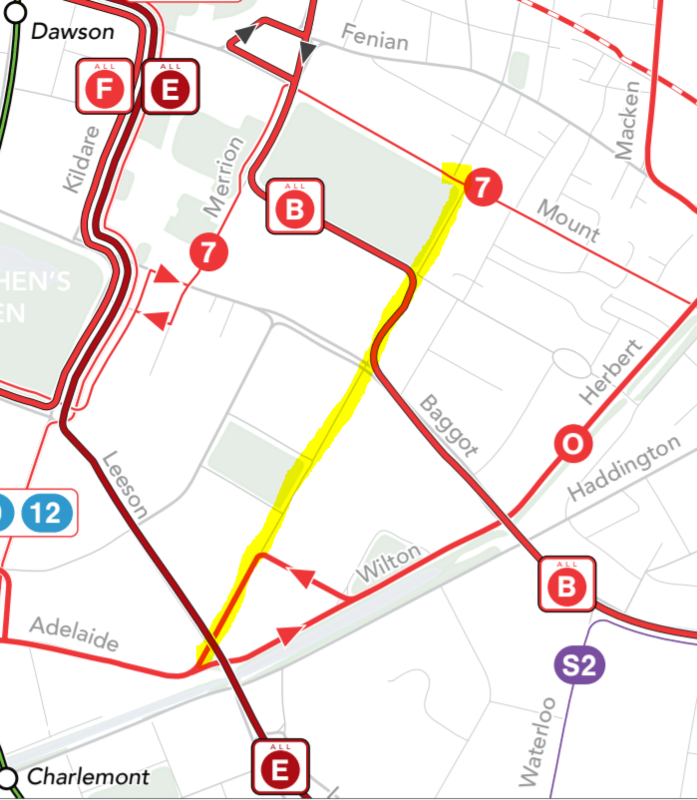 IMAGE: BusConnects adds bicycle/bus turning conflicts on a high-frequency and mid-frequency bus route to the street (in yellow). Meaning a segregated cycle route is needed more than before. The implied statement in the above question and the ending statement below shows a lack of understanding that people using cycling as a means of transport in Dublin includes is the young, old, and physically impaired. This route and the wider network will enable more people to start cycling. Businesses will be better off when safer cycling is enabled for their employees and a large amount of businesses in the wider area support segregated cycle paths (see CyclingWorks Dublin). The questions about BusConnects are good ones, but council have said that they will take account of BusConnects. But BusConnects — with buses planned to be making turns across people cycling along this route — increases the need to have a fully segregated cycle route. With the bus routing plan due to be implemented at the end of next year, BusConnects is also a extra reason why this route should be given priority. Loading is not an issue with the design which is used widely in the US and similar layouts in the Netherlands on retail streets with a larger volume of loading. IMAGE: Residents say they are concerned that the street is not wide enough for protected cycle lanes. Concern 3: Is the design optimal? Context:We are concerned that the street is not wide enough to take the proposed plan and have concerns about safety for all road users particularly at junctions. We also have concerns about how this design will impact traffic flow. The feasibility study listed different alternative plans. How did you arrive at this being the best plan? What User types were considered when deciding on this plan? How will drainage be dealt with on the roads. A range of detailed questions were raised about the junction both on the walk and in the Library. We can document many if it assists. It should be clear from the presentation to councillors — at which people from the residents association were present — that all road users were taken account of in the design and issues like drainage and power access to electric cars is being accommodated… why are these questions being asked again? When members of the residents’ get or hear answers, are they not passing these messages on? Why is the group now wasting public time and money by asking that questions be answered again? Indeed, electric charging points placed in line with the new car parking layout is a far better idea from a pedestrian point of view given that it will keep footpaths clearer. The idea that the group “are concerned that the street is not wide enough to take the proposed plan” is confusing to say the least — the feasibility report looked at what could fit in detail and draft plans have already been designed shown that it is possible to fit the design. As for the “concerns about safety for all road users particularly at junctions” — this issues of concern are unclear but the junction designs, as already outlined in more detail, will made it safer for all road users. Concern 4: How will the cyclists be regulated? Context:Experience along the Canal cycle lane has shown that cyclists are particularly unforgiving of pedestrians who need to cross over and we believe if they have a one-mile corridor it is essential their behaviour is regulated to ensure the safety of pedestrian and in particular, younger, older and visually and physically impaired road users. · What will be the speed limit for cyclists on the route? · How can cyclists be identified in the event that they violate these regulations? · Who will enforce these limits and is there an enforcement plan in place which can be shared with residents? ANSWER 4: It is again disheartening to see the group (a) imply that people who cycle are not included amount younger, older and physically impaired road users OR (b) not care about the attractiveness and safety this route will offer them. It is worth again stating that more residents current commute by bicycle than car, and some of these include school children. People cycling pose a similar risk to people walking, running, and those using electric mobility aids etc — that is to say a low risk, thus the same identification process applies not just in Ireland but across the world. Should the idea of improved safety and conditions be linked to just cycling or is this something that should apply to all road users? Should we stop the road building programme until some motorists start to behave better? Concern 5: Does the cycle plan best support the conservation of the Georgian Streetscape? Context: All developments in the area have to ensure that they adhere to the highest conservation standards. A basic premise of conservation is that there is the minimum impact to the built environment. How does DCC plan to maintain the Georgian street aesthetics in the context of the cycle route? (1) The messaging from the council are not getting to residents. In such as case: The council has said it will as much as possible not be changing the historic features of the street including not moving the stone kerbs and not moving the street fixtures (except maybe in cases where they block pedestrian crossings). (2) Some residents are looking for a pure Georgian street look. The best way to achieve this Georgian street aesthetics would be to not just remove car parking but fully remove cars, buses and bicycles from the street. A compromise might be to just remove car parking — the largest visual block of Georgian views. It is unlikely that the most car-owning residents would support the latter, so, it has to be asked: Why is the Georgian nature of the street only an issue for a cycle route? Context: As residents, we became aware of this proposed development through the newspaper and internet articles. The Department of Public Expenditure and Reform produced guidance on best practice consultation Consultation Principles and Guidance (2016). It sets out best practice for consultation with the general public. When did DCC consult with the residents in relation to a solution to the identified problem? When did DCC consult with the residents in relation to the design alternatives? What public consultation methodology or principle has been underpinning this proposal? ANSWER 6: The meeting with residents and route walk is just the start of public consultation — the public will be able to make submissions in the next two months. The project is not just following but, by having meeting and site walks, has gone beyond the public consultation requirements of the Road Traffic Acts. Concern 7: Why the timeline for Volo-city featuring in the timeline? Context: In the absence of a data-driven need for the development, there is a real concern that having a ‘show-case’ care protected cycleway along one of Dublin’s most historic streets in time for Velo 2019 is the real driver behind project. The residents that live in the area are not interested in vanity projects – they are only interested in projects which will improve the quality of life for all road-users. Was the Fitzwilliam Cycleway part of the Velo-city bid? Answer = No. Can we see the bid? Why is Velo-city mentioned in the project timeline? Is this really about a vanity project for Velo 2019 which will result in the permanent alteration of the streetscape along Fitzwilliam Street with no measurable benefit to the users of the street? Were the consultants asked to have the project completed by Velo-City 2018? Answer = YES. ANSWER 7: As already outlined, there will be clear and measurable benefits to the users of the street, but the ask to “improve the quality of life for all road-users” is really a roundabout way of saying priority can’t change for anybody if priority is lowered for anybody. This is an impossible ask if Government and local policy on active and sustainable transport and climate change are to be followed. There is a clear need to re-balancing of space and priority to walking and cycling — the Government’s climate change advisers are only the latest group to say this just today. Car-focused residents and commuters will have to face that much of this discussion is a mute point because the arterial route will see drastic change under the Government-funded BusConnects project to the extent that there will be a reduction in car use and, the growing trend in the city is already towards and further reduction in car use. It might be called a demonstration project as it is to be the first decent length of parking protected route and it is to use the junction design under development for the Clontarf Cycle Route. It is far from a “vanity project”. It’s of note that the project includes not just the Fitzwillion streets but also a redesign of the key junctions at both ends and in the middle, including readying them for BusConnects. Moving Forward: Chris agreed to engage immediately with the residents association to address all issues raised in a collaborative and consultative manner. I look forward to hearing from you and hopefully working with you to ensure this project and others supports all road users. RESPONSE TO ENDING STATEMENT: The idea people who are lobbying against a cycle Route are “pro-cyclist” is highly questionable, and we are also treated to the idea that people who cycle are the ‘other’. It is carefully implied that the project the project has no benefits to pedestrians, and that people who cycle are not and can not be residents, children, or the elderly. With the rise of CyclingWorks Dublin, they also have picked a poor time to imply that segregated cycling infrastructure is not pro-business. And the line that “we want to ensure that the needs of all are central to any design consideration”, in the context of questioning the justification for the route, is a thinly veiled way of saying we want the status quo — this is something any resident, councillors, or TDs interested in a sustainable city must resist. I am wondering are the “South Georgian Core Residents Association” connected to the resident who legally blocked a Simon Homeless hostel in the Fitzwiliam area? Whenever I hear such people objecting to projects that will improve the safety and livability of a street apparently on the grounds of ‘safety’ and ‘inclusiveness’ I know that A). They haven’t a clue what they’re talking about and B). They’re NOT concerned about safety or inclusiveness, but rather they’re concerned only about their own perceived (petty) needs and wants. You asked why they are asking questions that have already been asked and answered. I suspect you already know the answer but this is a tried and true tactic to delay and/or stop projects. Already they can say that “there are a lot of questions about this plan”. Asking these things over and over again both wastes the councils time (and with any luck they’ll run out of steam and the whole thing will grind to a halt like the north quays project which is a win for people who want to maintain the car focussed status quo). Asking loaded questions (including those hilarious ones which were “here’s a question and here’s the answer. what do you have to say to that!”) serves to imply things aren’t being done properly without any actual evidence of that. I mean, what difference does it make if they want to get this done before Velo City 2018? It’s like they are insinuating this is some ulterior motive they have exposed. Without anything solid to run with they are throwing everything they can at the wall to see what sticks. Is it Georgian enough? Did you think about pedestrians? Did you think about delivery drivers? How are those well known scoff laws going to be kept in line? Did you think about a special enforcement regime to protect people from them? Is the road wide enough? Motorists are characerised as people who are travelling long distances to get to work. Like cyclists aren’t going to work. Objectors are characterised as thinking about the handicapped, the elderly, children, with motorists being the last thing on their mind, although if I had to guess at their priorities it would be 1> Parking 2> Ease of driving 99> The elderly, pedestrians etc. I may have previously misrepresented the objectors arguments as “vague and spurious”, when it is now clear that they are in fact detailed and spurious. Concern1: Mostly reasonable questions that have been addressed. Concern 2: An irrelevant appeal intended to elicit an emotional response based on a extremely inaccurate context. The objector states that the ratio of drivers to cyclists is 8:1 when Cians figures show it to be closer to 1.25:1, and we know that the share of cyclists is growing strongly. Concern 3: Already answered. It has been made clear that the design is probably the first example of what is widely agreed to be the optimal design for such a cycleway in the country. Concern 4: Irrelevant “appeal to authority”. Cyclists behaviour is not relevant to the matter at hand. This would appear to be largely an exercise in noise generation based on the objections of a small but probably influential group of individuals. However, for once, there is considerable political pressure behind this project as well as the usual moral and rational arguments that should allow it to avoid being scrapped without a serious fight, or at the very least serious political fallout if it does go the way of so many other similar projects. We shall see. What were the councils answers to their questions? I think that the way of parking on the very first picture, Fitzwilliam street, is unsafe. Because a driver who is driving backwards out of the parking space can’t see coming traffic. I think this is project is one that will benefit all road users, particularly car drivers. The current layout is lousy for everyone. I cycled the route yesterday, and had to take the lane as there isn’t enough room at the edge, due to the staggered effect of cars parked perpendicular to the road. The proposed layout will take cyclists away from cars. If you’re trying to park you have to block the whole road while you maneuver. It’s a lot more awkward, compared to parallel parking. At the end of the day this will reallocate road space from car parking to cycling. Given there is excess capacity of parking spaces, and the new layout will meet current demand, it’s hard to see who will really lose out. As for the Georgian Streetscape, I would have thought cyclists to be more in keeping with the historic aesthetics of the area. I am most concerned that as a pedestrian, crossing the road from my flat will now become difficult, because I will have to negotiate (a) a row of parked cars (b) two cycle lanes (c) a car traffic lane. I find this challenging and don’t think the proposed plan safeguards people in my position. No doubt you think the more old people like me who are killed by bad road design is just a collateral benefit, disabling those for whom the best good is a velo-city. I am very impressed by the tone of your article and many comments, which eloquently display the concern your cyclist lobby has for pedestrians, residents, disabled people or mothers with buggies, and which eloquently makes the case against a cycle lane – not wanted, not needed, will damage the tourist area this has become: therefore it must happen! @David — The death of Roger Handy was an a sad event, but I’m really unclear what it has to do with making a street safer for people walking and cycling. For anybody unaware of the street as it currently is — this is what it looks like: https://irishcycle.com/2019/01/05/a-bit-of-perspective-needed-on-the-fitzwilliam-cycle-route/ — it’s hardly a safe environment. Do you really think crossing the proposed plan of a narrowed main carriageway and cycle lanes on both sides is harder to cross the massively wide and open roadway the currently exists? As for “No doubt you think the more old people like me who are killed by bad road design is just a collateral benefit” — if you’re making statements like that, I might as well ask: do you expect your irrational fears to be place above making the streets of Dublin safer for people walking and cycling? * = some sections without cycle lane but an even wider carriageway.